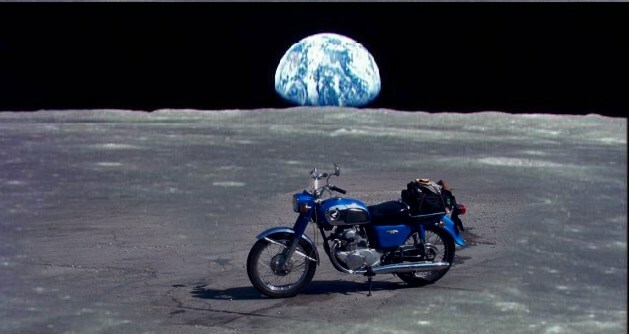 If you want to motorcycle on the moon, bring your own air. Welcome to my web site. Click the peace symbol for my latest CD175 web log. My site now contains over 30 web pages, and many of them have a lot of text. Since I started my website in the summer of 2001, I've had hundreds of people e-mailing me from all over the world, which is good. Almost all of them are friendly. Unfortunately I have been hit by spammers, and needed to find a safer way to hear from readers. Click HERE to leave a message for me . This website is owned by Robert Bezeau, Ontario, Canada. 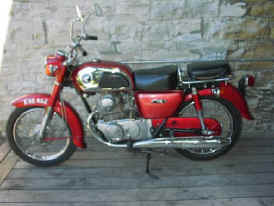 Some of the contents are about the 1969/1970 Honda CD175 motorcycle shown above. 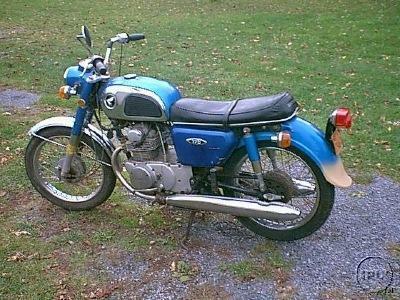 I have pages on my other motorcycles, and web logs of the maintenance I performed on the most recent ones. Update, December 2008 I started a Blog. The winter was long and cold and snowy. I was bored, so I decided to make a blog covering stuff that I didn't learn off a Honda gas tank label. Obviously you don't need to know this stuff either, unless you also are bored with nothing to do. Click HERE for the link to the Motorcycling topics in my general interest blog. "Red", the CD175 K3 I bought in July 2001. Red's weblog can be found by clicking here. A photo of "Blue Lite" shown as I bought it December 2001 Click here for the weblog.